Backyard and exhibition poultry flocks are at a distinct health advantage because they run free. Free-range poultry are able to select exactly what they need from the yard in terms of trace elements and vitamin-rich green food. They also get copious amounts of direct sunshine, the greatest health tonic of all. On the down-side, however, free-range poultry flocks are exposed to many germs that abound in wet areas after rain. These wet areas are hazardous to health. Wet weather and disease prevention programmes should be incorporated into a regular health programme. The programmes described on this page follow organic farming principles and use natural methods to control disease and, with the addition of a vaccination programme, produce a naturally disease-resistant flock. Additional vaccination programmes may be necessary for chickens, whilst gamefowl and waterfowl require special programmes to prevent those diseases (Blackhead, Hexamita, Giardia and Cochlosoma) transmitted by motile protozoal parasites. 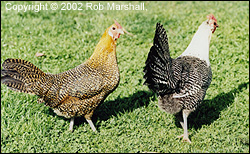 The backyard chicken makes a remarkable pet, especially when reared soon after hatching. It has the loyalty of a dog, the intelligence of a cockatoo and the cheekiness of a monkey. It is one of the few pet birds that can pay its way, delivering a pay-load almost every day in the form of a "prima protein" nutritious egg. The chicken is a highly efficient egg producer, but must be fed correctly. 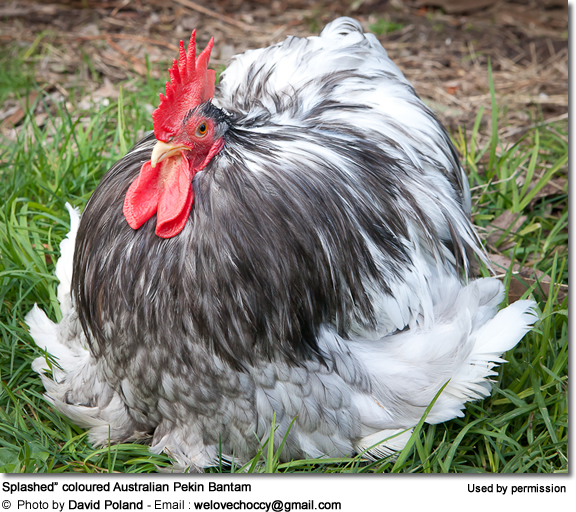 Without the correct feeding the backyard chicken becomes exposed to ill health and disease. Certainly, the backyard vegetation and a grain diet provides these birds with much of their nutritional needs, but nutritional supplements are still required for continuing good health. A regular disease control programme keeps the hens in top shape. Ducks and geese are remarkably resistant to most illnesses. However, they are prone to illness from moulds and giardia following wet spells. A structured approach to parasite and disease control is necessary to maintain the health and wellbeing of backyard game fowl. Care must be taken to house “disease-compatible” species together when keeping different species of game fowl. For example, pheasants and other game fowl may be successfully "run" with geese and ducks who do not "carry" Histomonas (blackhead) infection. Game fowl, however, must not be "run" with chicken (fowl) species who commonly carry Histomonas and Heterakis (caecal) worms and readily infect juvenile and newly introduced game fowl with often fatal outcomes.